Lord Renfrew, speaking in Mexico, described the ‘network of corruption’ in the antiquities market. Art theft usually don’t go as planned and hoped by the thieves. Buying antiquities souvenirs is harmful. Think and research before you buy. Prevention of antiquities smuggling is on the list. The lids have arrived in Cairo and have been formally returned. Somaliland doesn’t have the experience or financial resources to effectively protect their ancient art. The government has given First Nations their full support for return requests. The Yuquot Whalers’ Shrine is in the American Museum of Natural History and, perhaps, shouldn’t be. The museum has not received a request for repatriation. The piece dates to 1920. More than 4000 pieces were returned from a number of countries. The trader pleaded guilty to two counts of misrepresenting Indian-produced goods. The thief told the trader that the icon was his grandmother’s. Reddit’s hiking and climbing community tracked her down and reported her to the NPS. The piece had a piece of steal from the World Trade Center wreckage. Detectives found the stolen trailer in the man’s backyard and the LA Police Department’s Art Theft Detail recovered some but not all of the stolen works. St. Bernard de Clairvaux Church was imported from France by Hirst. The man’s mental state has been questioned. The George A. Peabody garden urn was stolen from the Danvers library in 2010. It is unclear if the urns or the human remains were the target. The missing antique items were found in the Wisconsin man’s possession. It isn’t certain the shield will actually go back to Acoma Pueblo, the sale was just halted. Spray-painted graffiti one week before it was due to open. The interior was mostly wood and the building is now ruined. An investigation has been opened into the cause of the fire. A step forward for the prevention of the trafficking of antiquities into Germany. Half of the pieces are Hellenistic, the other half appear to be from Peru. Accusations that the South Dublin City Council is allowing a graveyard to be destroyed. The pieces are being sold by the insurance company that paid out for them. The medals were not targeted as they were in a bag on a train. The pieces were identified by a routine Art Loss Register check. The “illegal metal detectorist told the authorities he was ‘in it for the money'”. Half a tonne of lead was taken from the roof of Stockton Parish Church. The lead theft from the Hamilton church has caused thousands of pounds worth of damage. A string of failures in policy to prevent Tasmanian ancient art from being vandalised. The Art Gallery of NSW is under fire for allowing cooking for events to go on too close to artworks with food causing damage to the pieces. The artist Marilyn Andrews is hoping people will keep an eye out for it as it is unclear how or why the painting has disappeared. Not primarily for sacred art theft, but an interesting result of increased protection to a temple. Tamil Nadu would like to use ex defence service personnel to protect monuments but haven’t had final approval. The thieves took an idol of Durga Devi, three silver vessels, and three silver face masks. Proper documentation, which the state doesn’t have, is a must for repatriation claims. The Kalash at the top of the 10th/11th century temple was toppled. Steps forward for antiquities documentation and information sharing. Four pieces were stolen from the locked temple. Six robbers attempted to steal statues from the temple; guards were able to arrest two of them. 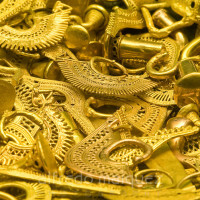 Mostly gold and silver ornaments taken from the two Karnataka temples. The India Pride Project, “a group of motivated stakeholders comprising people from across the globe”, working to bring Indian antiquities home. Who is M. Deendayal, the 84-year-old at the centre of a major idol smuggling bust? Officials from 31 temples went to see the haul and two have been identified so far. The arrest of G. Deenadhayalan for antiquities-related offences. The man was arrested in Mahabalipuram. This is a trickle-down arrest coming from info gathered during the Deenadhayalan arrest. A closer look at arrested idol dealer G. Deenadayalan. Fall out from the Lee U-fan forgeries. The country’s new heritage plan is financed to the tune of $1billion but deliberate destruction has been going on for decades. Two different artists have claimed their work has been stolen. A fight in the streets of Wales is exactly what one should expect over a Viking reenactment axe theft.